I finally had the chance to watch the film The Corporation. The film centers on the evil committed by corporations as a way to show the failings of capitalism. I thought this film was relevant due to what’s happened over the last year and certainly some would be persuaded by the points made in the film. As a whole the film does make its arguments in a convincing way, but of course that doesn’t mean the arguments are right. It certainly is a film worth watching, but its bias distorts much of the valuable information. Below are major players in the film (an overview of the film is available on wikipedia for further review, and the web-page is linked above), my major criticisms of the film and some recommendations of how it could be more worthwhile. The major players are Naomi Klein, Noam Chomsky, and Michael Moore. Naomi Klein is of course famous for last year’s book The Shock Doctrine, in which she took a little known Milton Friedman phrase and morphed it into a doctrine she believes was used to justify the Iraq war (her book has been challenged by Johan Norberg of the Cato Institute). Noam Chomsky is of course professor of Linguistics from MIT. He’s notable for his anarchist views and outspoken criticism of US foreign policy and capitalism (it was a Chomsky book that Hugo Chavez said was suggested reading for all people during a UN appearance). Chomsky is also the subject of another film by Achbar, Manufacturing Consent. Most people should be familiar with Michael Moore. He may be the most famous documentary film-maker in history and he has a fairly strong following. Milton Friedman is also part of the film, though his time is somewhat short, his appearance is significant. Milton Friedman is the most important economist of the last 50 years with a very liberal position when it comes to businesses and how they operate. Friedman is the most significant counter-weight in the film. There are many other participants who contribute to the film, but these four were the most significant in my mind. 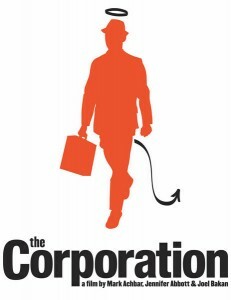 The movie analyzes corporations as “persons” and repeats the concept that a corporation is a legal person. This point is driven home like no other point in the film. This becomes most significant when the corporation is diagnosed psychologically. The tactic is treating the corporation as a person and then assigning it human traits, which conveniently fit the bill for a psychopath. The trait is cited and then a corporation is shown to have committed an act that fits the trait. I find this tactic very dishonest, because it’s easy to steer people’s minds down a track when you set such narrow criteria and cherry-pick examples. The film-makers also fail here, because each trait is “fulfilled” by a different corporation. If they wanted to show that corporations in general were psychopathic, they should have picked many corporations and shown how they all compared against the psychopathic traits. Because the purpose of the film is to maintain the effects of drama and not serve as a scientific analysis, it’s not surprising that effort was avoided. This is really just a straw-man argument and resembles some of the tactics used in the 9/11 conspiracy film Loose Change, which uses similar manipulative language and news reports to build a story that 9/11 was an inside job. Like Loose Change, The Corporation needs some serious fact checking. I have not had the time to look into every claim made by the film. In fact, I don’t necessarily think that they are lying or making things up. I don’t doubt that much of what they show happened. The problem comes in the telling of the story and the way facts can be turned around a bit or motives assigned that may or may not exist. Two that stick out came from Michael Moore’s mouth. I already have enough trouble taking what he says seriously. He is not reliable source for much of anything. I believe he poorly understands information and does not sufficiently understand the counters to his arguments. In the film he talks about Coke selling Fanta in Nazi Germany as a way to make money on both sides. A simple search on snopes brings up strong counters to what Moore stated. While he wasn’t entirely wrong, he got enough wrong to create a great deal of distortion. He also referenced the Columbine Massacre and the fact that Lockheed Martin is the largest employer in Littleton. His point being that the parents fail to make the connection between what they do for a living, building WMDs, and the Massacre. The connection is a stretch and not very meaningful. I also take issue with the fact that he implies that all Lockheed Martin makes is WMDs. I am a Lockheed Martin employee (just to expose my bias) and I don’t work on WMDs; I work on satellites. A great deal of the work at Lockheed Martin has little to do with war or WMDs. Since the psychopathy of corporations are the center of the film, you would expect that the film-makers would have had a solution. Not really. It’s mostly that corporations are bad and it’s in their DNA. The very existence of the corporation is the problem. What’s the solution, Government? The same group who had trouble handling Hurricane Kartrina? I’m not anti-government by any means, but I find that to be a lazy solution to any problem. It doesn’t really address the actual problems caused by corporations. It also negates all the evil that has been done by governments as well. It takes a very noble government to control itself when it has the kind of power it seems some people want to give it. Corporations may be legal persons, but they have no emotions. Milton Friedman is quoted with his famous line that corporations’ only obligation is to get a return to the shareholders. Because this is be true, it’s easier to hold corporations accountable than it is the government when something goes wrong. The only wrench is when government and corporations get too friendly. While much of the film bothered me intellectually, there were some things I found beneficial. The inclusion of Sir Mark Moody-Stuart, former chairman of Royal Dutch Shell, I thought was a nice touch to the film. The film-makers included footage of a protest outside of Moody-Stuart’s home. The protesters hung a sign on the house accusing him of being a murderer of the environment, because he was the head of an oil company. In the footage, Moody-Stuart actually came out and reacted well to the protest and ended up having tea with the protesters and a rather nice discussion. This story added a human element and showed that the film-makers understood the fact that the heads of corporations are people too. I think this fit in the film without affecting their premise, because they are looking at corporations as something separate from humanity. The Corporation could be a better film. I think it made some good point in showing what some corporations have done and the negative effects that resulted. Certainly, there are many instances where corporations have done horrible things, whether intentional or not. I think it’s important to know about those kinds of events so they don’t continue and the damage can be minimized. To really bring that home, the film-makers should have emphasized the good that corporations do as well. Rather than show the corporation as a psychopath, the misdeeds have been the center of the film with the people who committed the misdeeds held accountable. The film could have been an analysis of the market system and how bad things may occur, then suggest ways to fix the any problems. Unfortunately the film falls short and amounts to a propaganda film against the capitalist system. I still recommend the film, but more to know what’s being said than for any educational value. Part one can be found here; you can follow the trail to get the rest of the film. Part one of a critique can be found here. If you want to run a successful payday loan business, you will need good cash advance software.